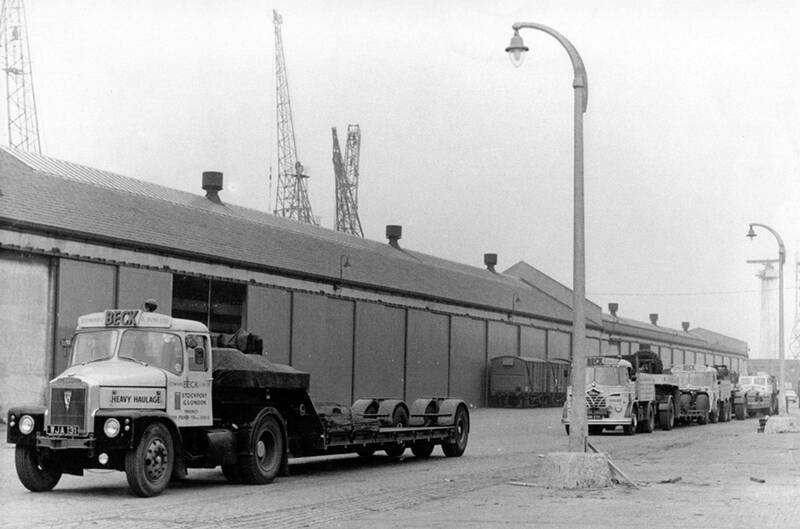 The long gone Salford Docks was one of the main collection points for imported American Caterpillar heavy plant machinery. 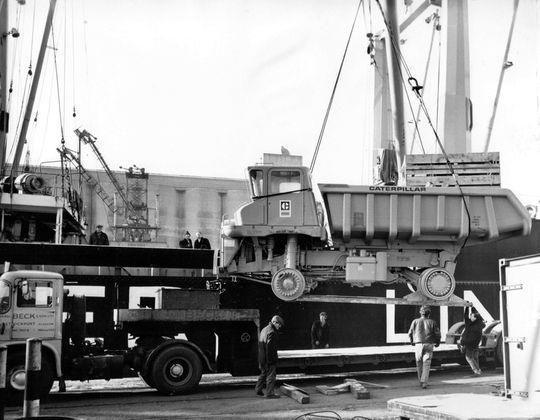 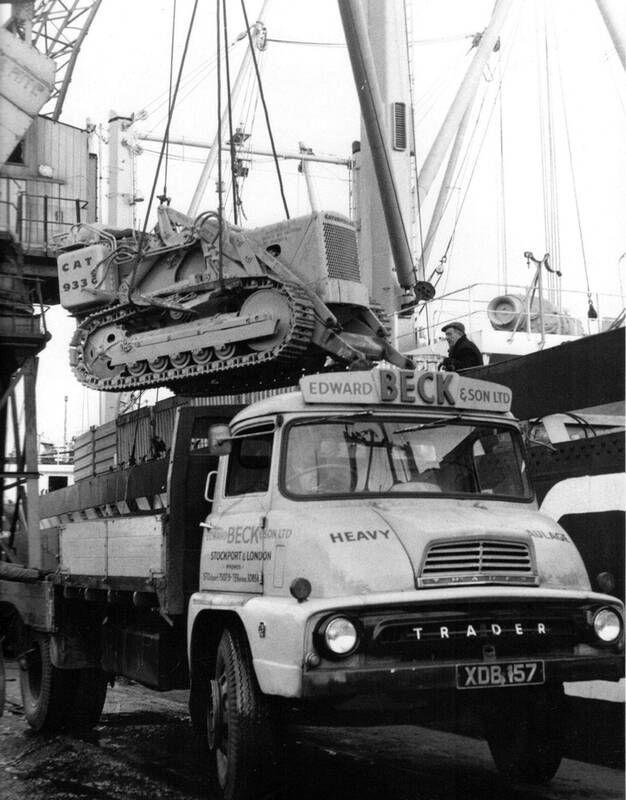 Becks invested heavily to ensure they always had around 50 trailers parked up at any one time on the docks so that as and when a ship docked all of the Caterpillar equipment could be loaded and taken off the dockside immediately, saving Caterpillar a fortune in quayside storage fees. 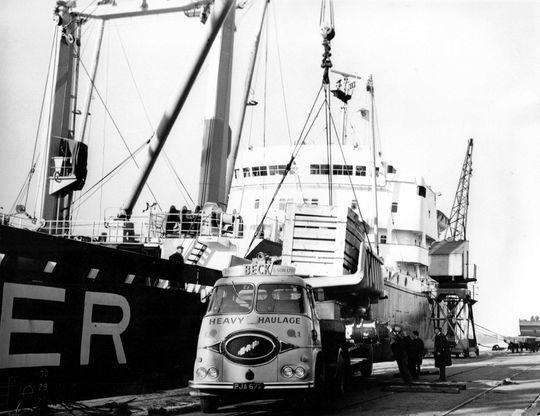 Click on any picture below to view full size. 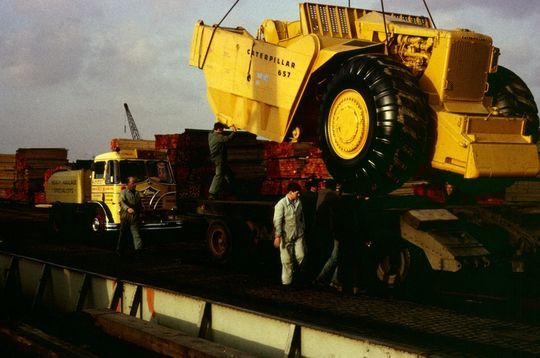 Pictured loading up a Caterpillar 16 motor grader on the quayside at Salford Docks is FG Foden 4x2 tractor unit Reg No KDB 703. 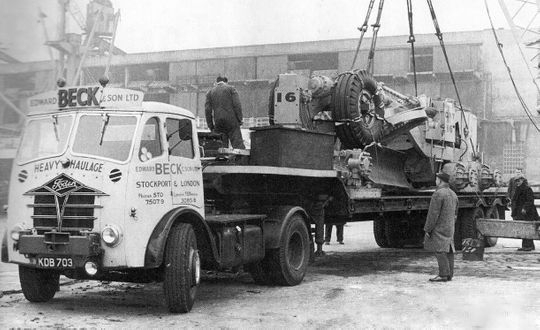 A brand new addition to the fleet in 1955 it was driven on a regular basis by long time serving Beck's driver Brian Daniels. Foden 4X2 tractor unit Reg No KDB 703, driven by Brian Daniels, pulls out of Salford Docks loaded with a Caterpillar 16 Motor Grader. Introduced in 1963 the Caterpillar 16 Motor Grader was only ever manufactured in the USA, thus all examples found operating in the UK would have been imported from America. 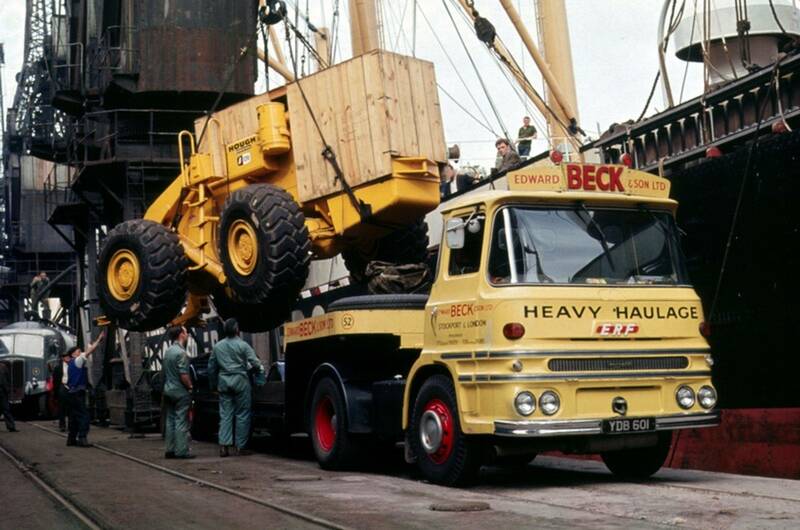 A busy scene on the quayside at Salford Docks during the loading of a Caterpillar 769 dump truck on to one of Beck's four in line low loaders. 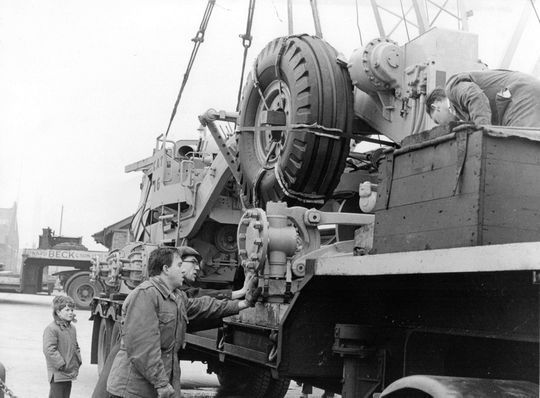 Another piece of imported Caterpillar heavy plant equipment is seen here being man handled into position on to the back of one of Beck's step frame trailers on the quayside at Salford..
A young boy looks on as a piece of Caterpillar equipment is lowered on to the trailer and secured into position before being taken to the depot at Greg Street in Stockport. 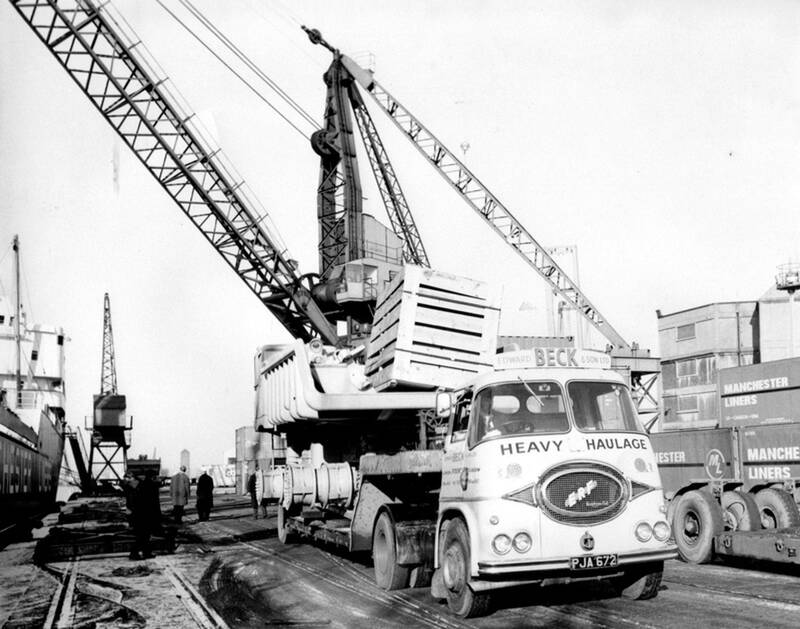 Boalloy Cabbed ERF 64GX heavy duty 4x2 tractor unit Reg No YDB 601 is pictured here in 1965 while loading up an International (Hough) loading shovel on the quayside. One of two superb colour photographs taken at the time which are best viewed full size by clicking on the picture. Another superb colour photograph taken in 1965 shows the loading up of an International (Hough) loading shovel on the quayside at Salford Docks. 1966 and Thames Trader 4x2 tractor unit Reg No CJA 848C, a brand new addition to the fleet in 1965 is parked in front of Foden 4x2 tractor unit Reg No KDB 703. They are waiting to load up with Caterpillar bulldozer's which had arrived by cargo ship from the U.S.A. 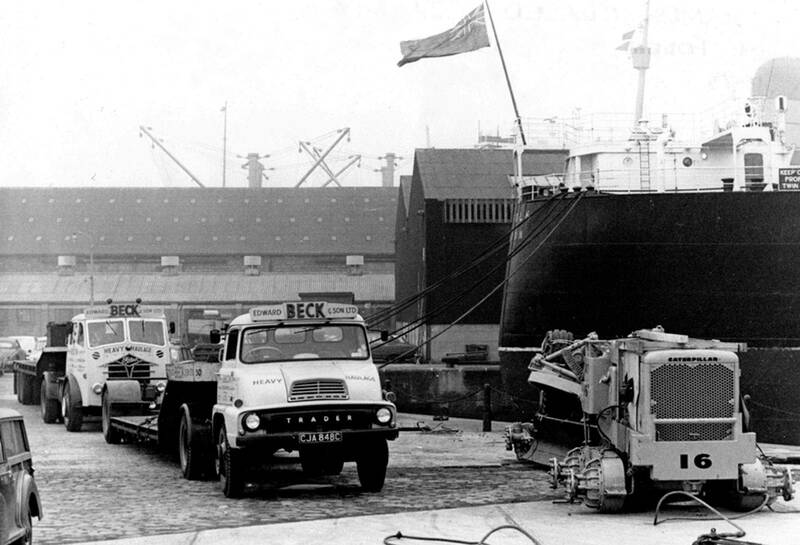 When a ship docked at Salford smaller vehicles in the Beck fleet, such as this Thames Trader four wheeler Reg No XDB 157, were pressed into service. This enabled the ship to be unloaded as quickly and efficiently as possible, thus avoiding any quayside storage charges. Scammell 4x2 tractor unit Reg No WJA 131 is pictured here on Salford Docks along with several other of Beck's vehicles awaiting the docking of a Manchester Liners ship with American built Caterpillar equipment on board. 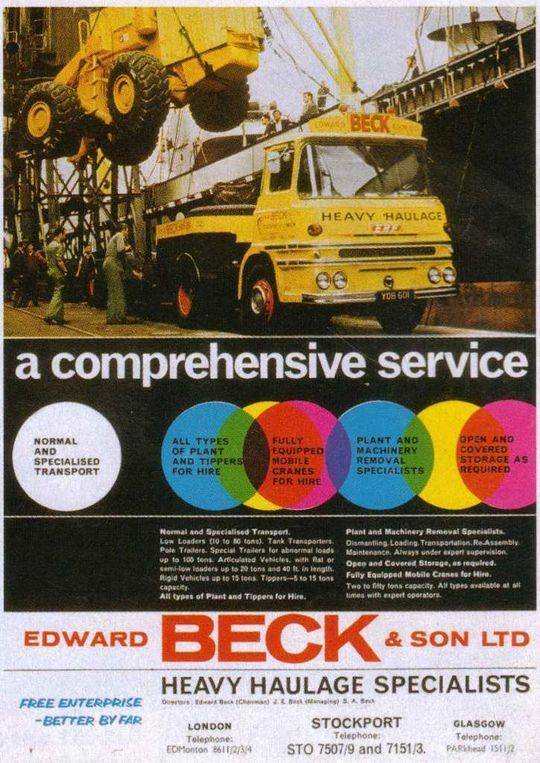 Beck's always had a large number of trailers available when a ship docked which saved Caterpillar a fortune in quayside storage. 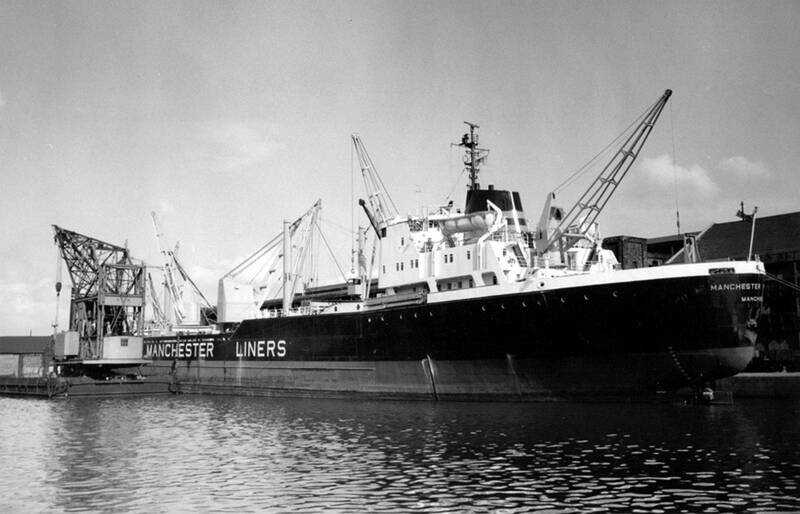 One of Manchester Liners vessel's is pictured discharging its load of Caterpillar equipment at the quayside of Salford Docks in 1967. 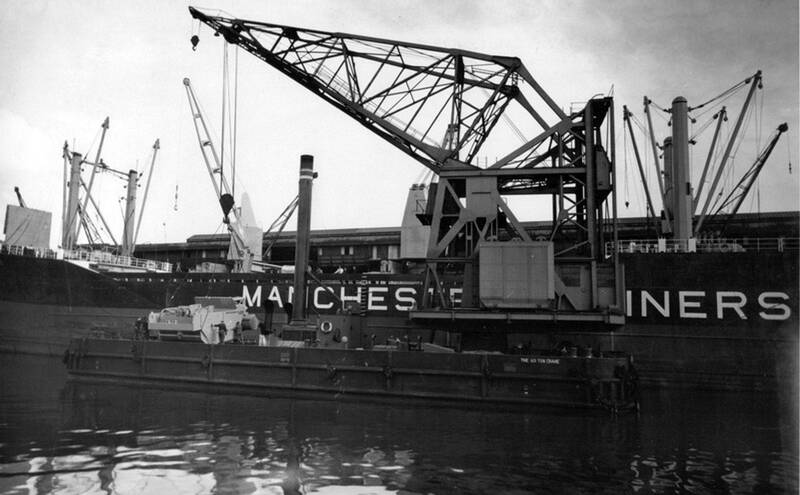 Note the floating mobile crane. 1967 and Jennings LV Cabbed ERF 64GX heavy duty 4x2 tractor unit Reg No YDB 597 is seen here on the quayside during the unloading of a Manchester Liners vessel. 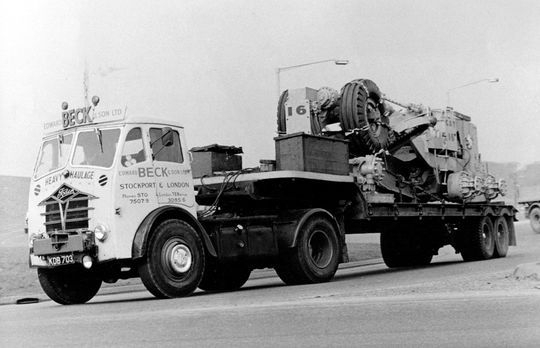 This particular load was a Caterpillar 769 dump truck. 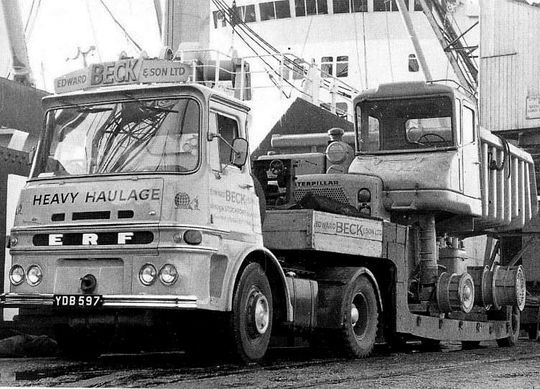 Another shot of Jennings LV Cabbed ERF 64GX heavy duty 4x2 tractor unit Reg No YDB 597 on the quayside after the loading up a Caterpillar 769 dump truck. 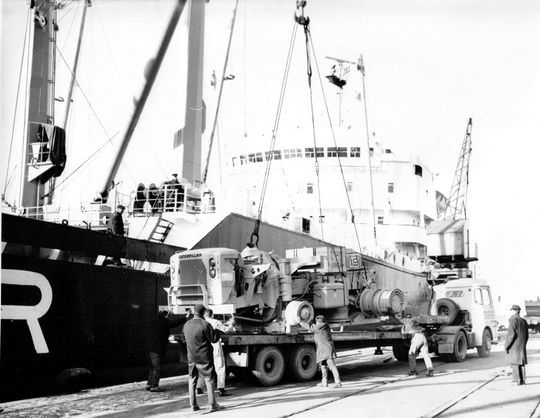 Foden S20 4x2 heavy duty ballast tractor Reg No VDB 539, driven by Stan Ardern, is seen here on shunting duties on the quayside in 1967 during the loading of a Caterpillar 657 Scraper. 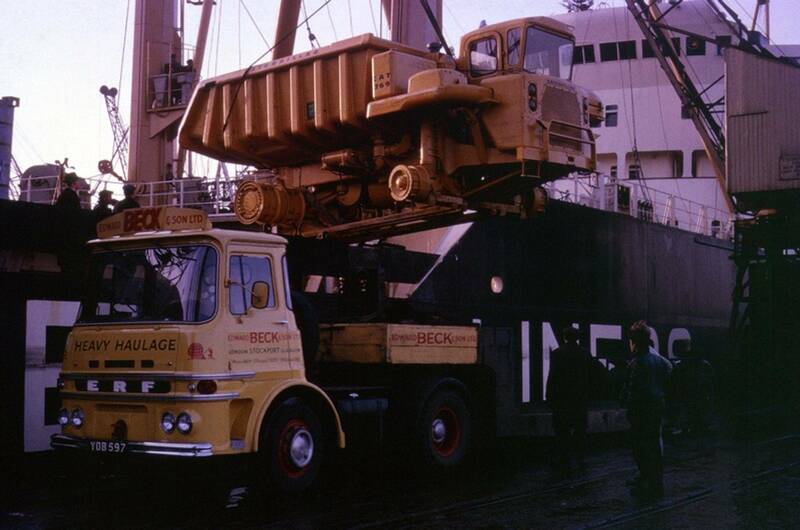 1962 registered KV Cabbed ERF 64GX 4x2 tractor unit Reg No PJA 672 is seen here on the quayside at Salford Docks while loading up with a Caterpillar 769 dump truck. 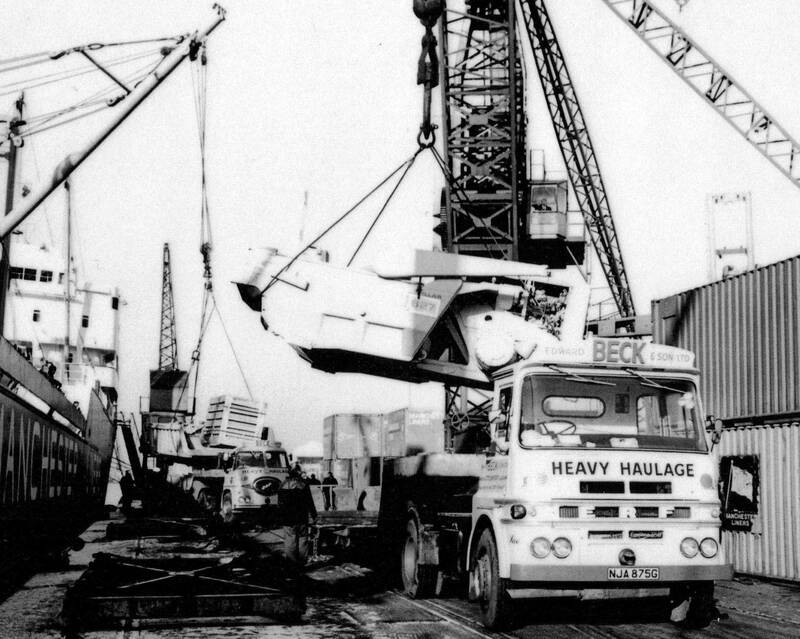 Another shot of 1962 registered KV Cabbed ERF 64GX 4x2 tractor unit Reg No PJA 672 on the quayside at Salford Docks while loading up with a Caterpillar 769 dump truck. 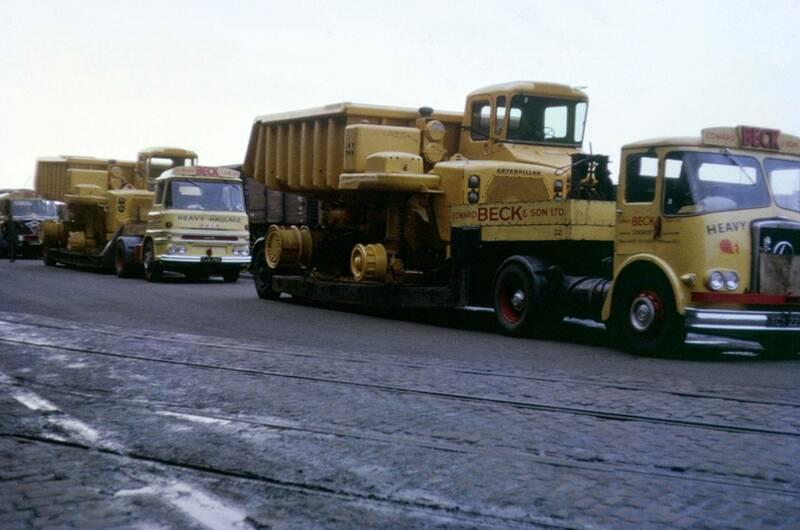 A convoy of Beck's low loaders all loaded with Caterpillar 769 dump trunks destined for storage at Greg Street depot prepares to leave Salford Docks. 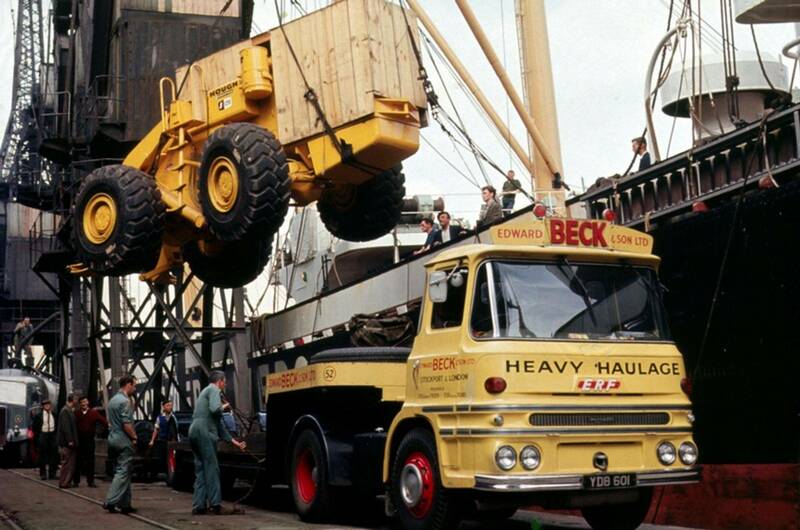 1969 and LV Cabbed ERF 4x2 tractor unit Reg No NJA 875G is seen here on the quayside while loading up a Caterpillar 657 Scraper.